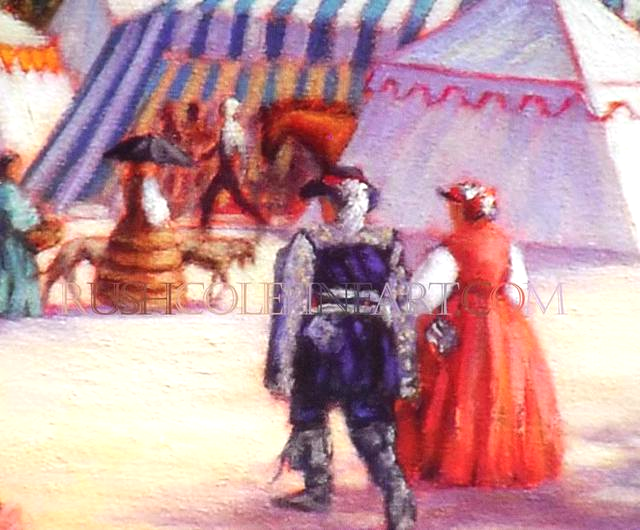 "RENAISSANCE MAGIC" came into the world as the result of my falling desperately in love with Renaissance Fairs. After attending numerous events over the course of several years, I found myself missing that fabled world as soon as the annual Fair was over again for another year. Mourning a time that was long gone. Or maybe not. 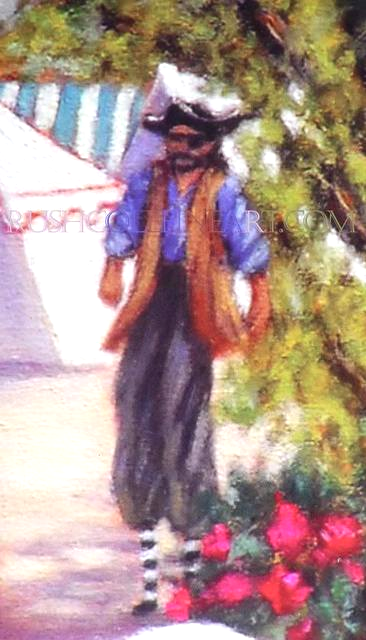 Finally, I decided to take matters into my artist's hands and paint a memory that I could live with all the time. Call me an escapist, but I wanted to feel as if I could look at the image and step backward several centuries in time into a magical realm whenever I pleased. 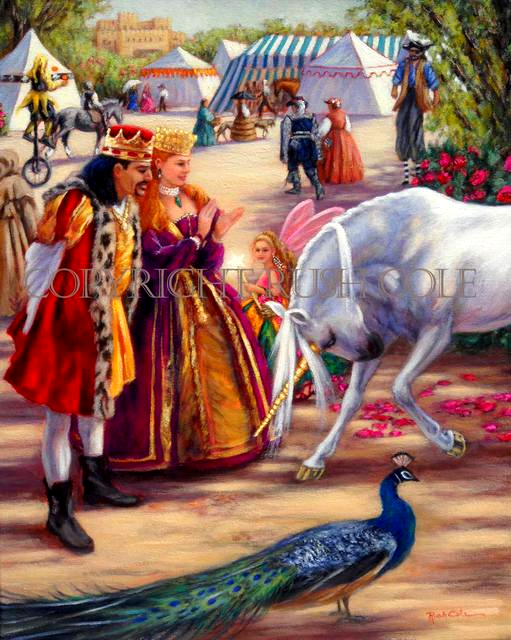 From the moment I made that conscious decision to create art that was the essence of what I felt when attending Renaissance Fairs, I knew there would be a snowy white unicorn, front and center, bowing to royalty. Unicorns are mentioned numerous times in widely ranging cultures and sources from around the world, including the Bible. Several ancient Greeks also wrote of them, although not as part of their mythology, but as an element of their ordinary reality. Descriptions of unicorns vary; however, they are all purportedly attracted to those who are pure of heart and mind, kind and virginal in nature. I made the Queen fair of hair and skin, Celtic, perhaps, the better to dress her in royal purple velvet and bronze satin with gold braid trim. Ah, and then I designed her jewels, as sumptuous as what would please me, myself. An enormous emerald pendant is suspended from three strands of pearls in a choker, with earrings and bracelets to match. Even the bodice of her gown is sewn with pearls along its neckline. A glorious golden crown is atop her fiery hair, while her badge of state hangs from a thick cord attached to a belt around her slender waist. 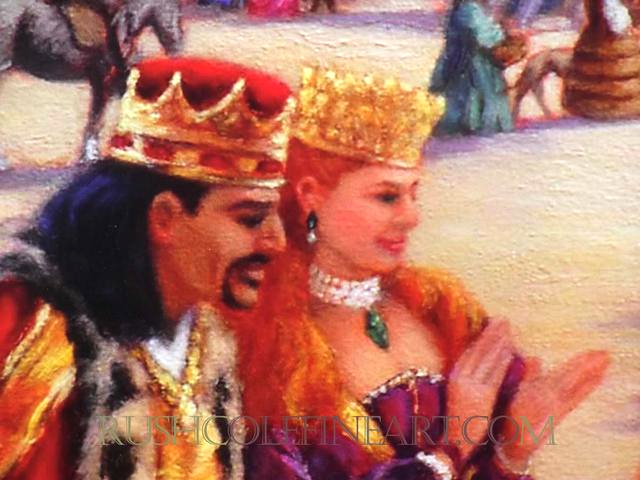 The handsome King could be from Spain, or Portugal with his black hair and rakish Fu Manchu. Fittingly, his robe is deep crimson trimmed in exotic fur, while his tunic is bright gold satin. White hose match a finely woven shirt and his short boots are crafted of soft leather. A massive gold crown over a crimson velvet cap covers his royal head, while his badge of state is fastened to a strong golden chain around his neck. 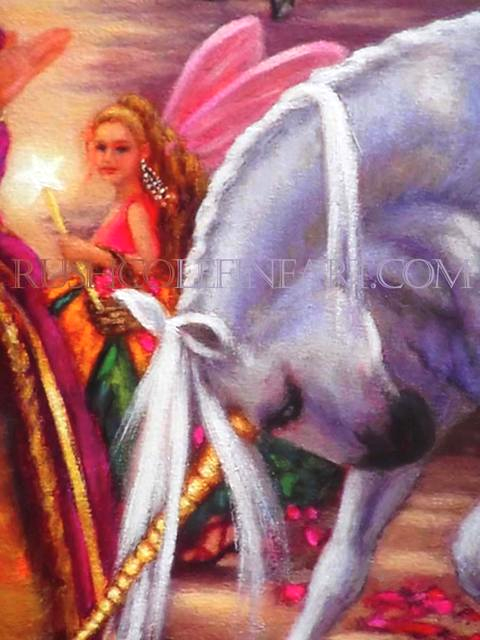 Unseen by the unicorn and nobility, a diminutive fairy drifts by, her beautiful face softly smiling. Again, I delighted in fashioning her clothing, combining rich green with pumpkin orange and hot geranium pink for her dress. Long blonde hair tumbles down her back while bling earrings glitter in strands of diamonds from her delicately pointed ears. Soft rose pink wings are folded behind the fairy; she lights her way with a glowing starry wand and strews rose petals in her path. 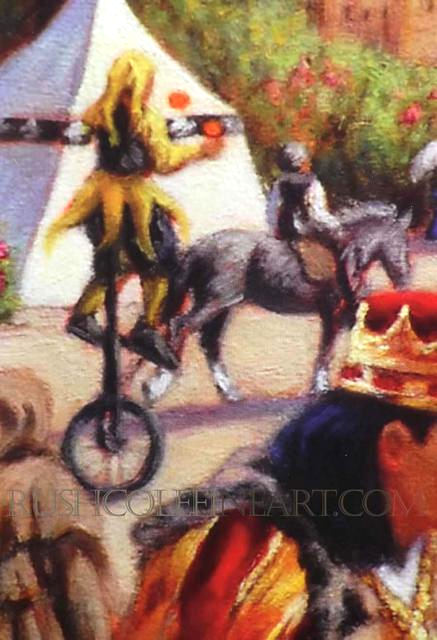 "RENAISSANCE MAGIC" was one of those paintings that felt more real than make-believe as I composed and worked on it. There were absolutely no challenges in bringing to life every single aspect of it. At last I concluded that we humans are gifted once in a while with the opportunity to literally birth something into this reality, something that opens a door into another realm, if even for a moment or two. This image came through me; however, I have no doubt at all that it originated from somewhere else, a place of beauty and peace and color and happiness, a magical place where one can be a child again in the blink of an eye.